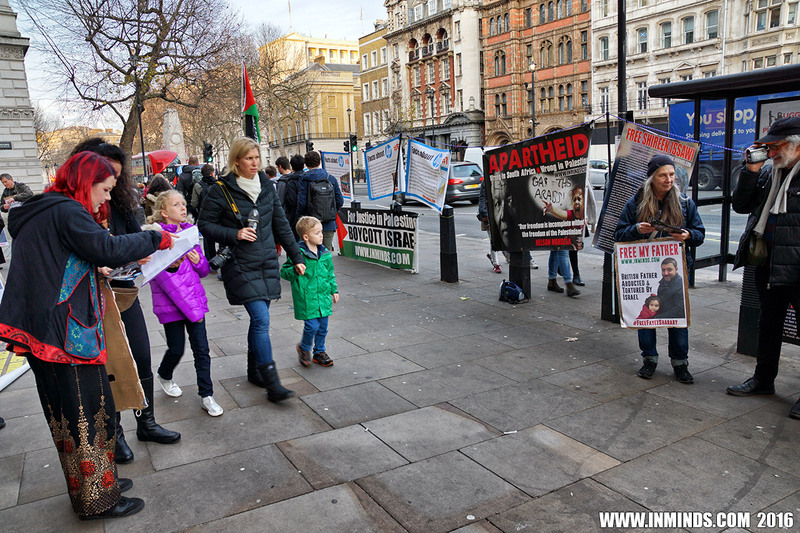 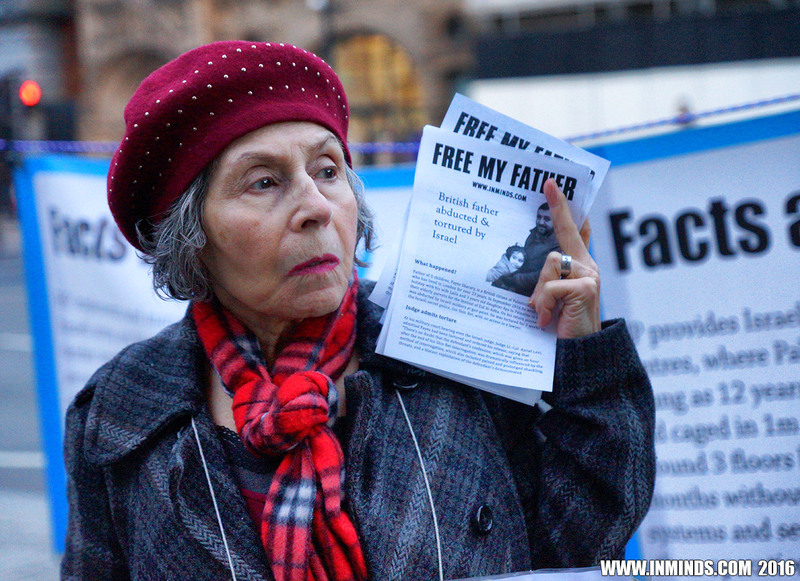 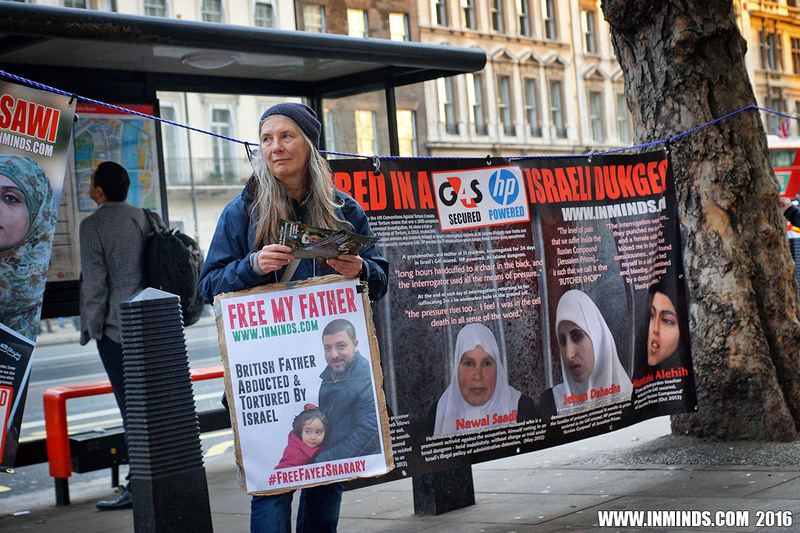 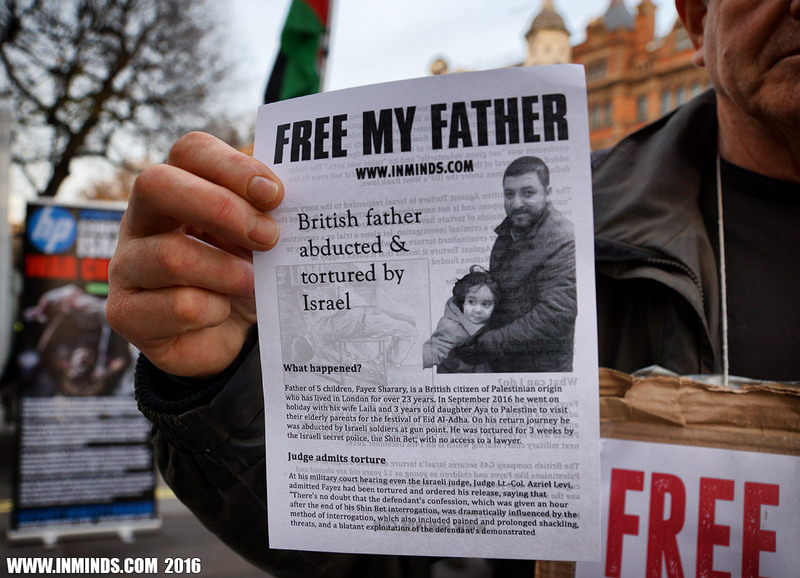 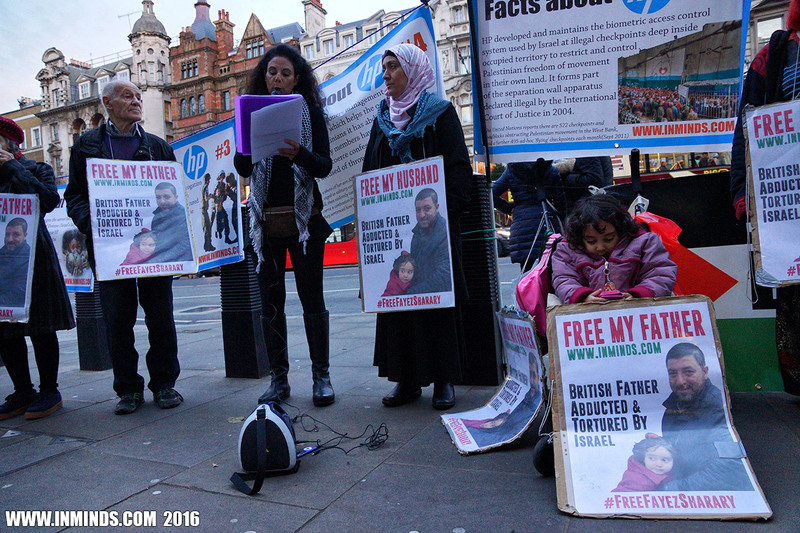 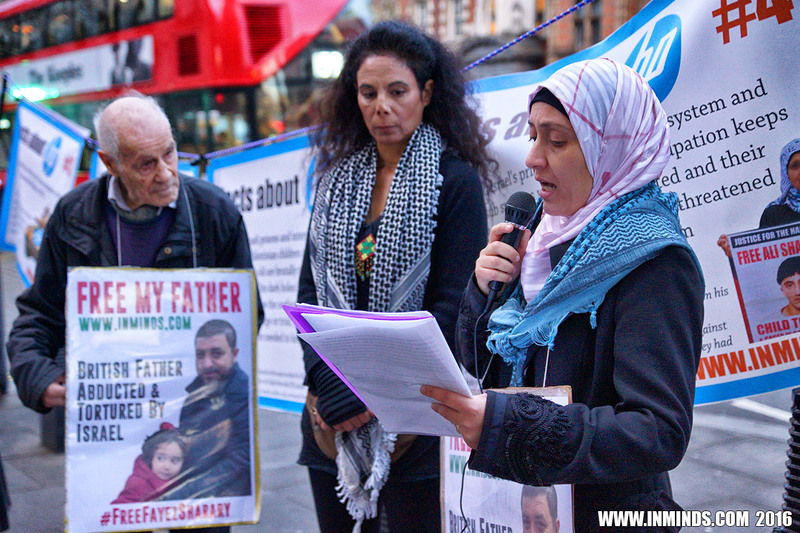 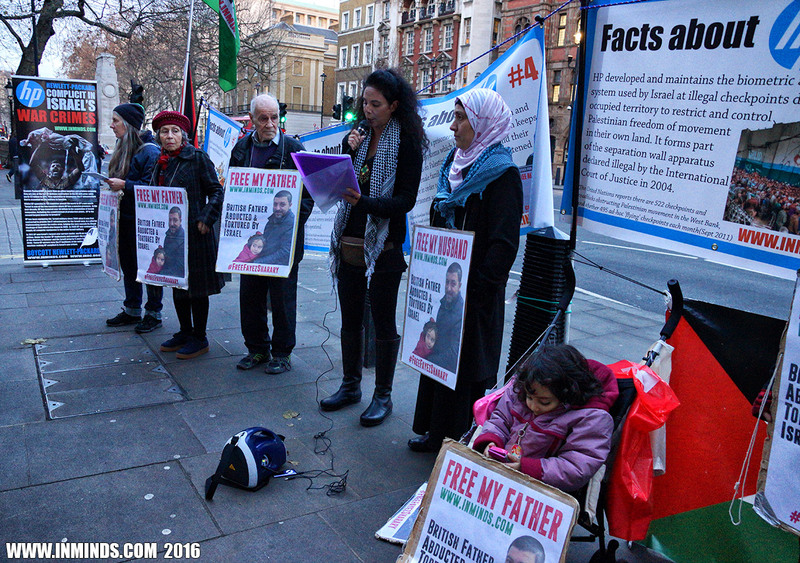 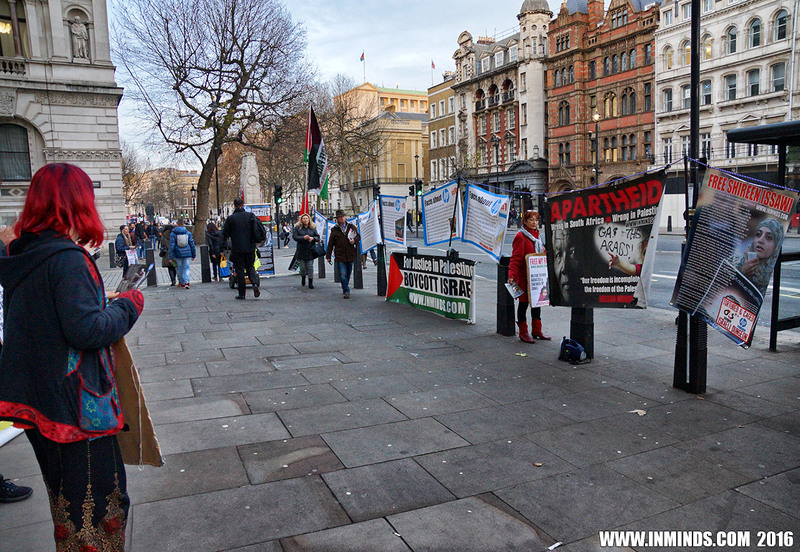 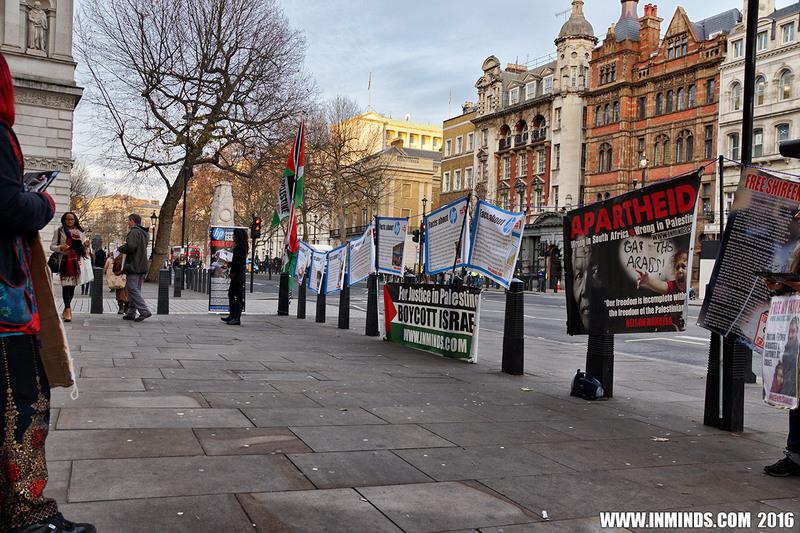 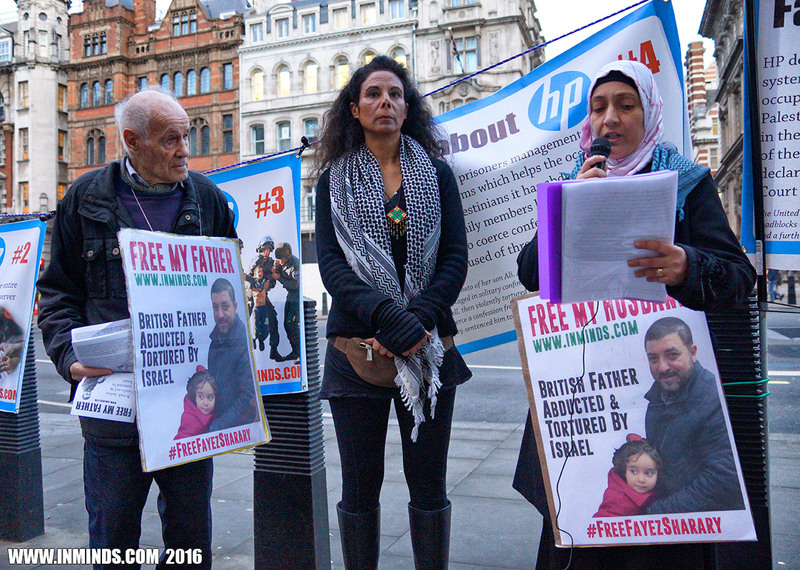 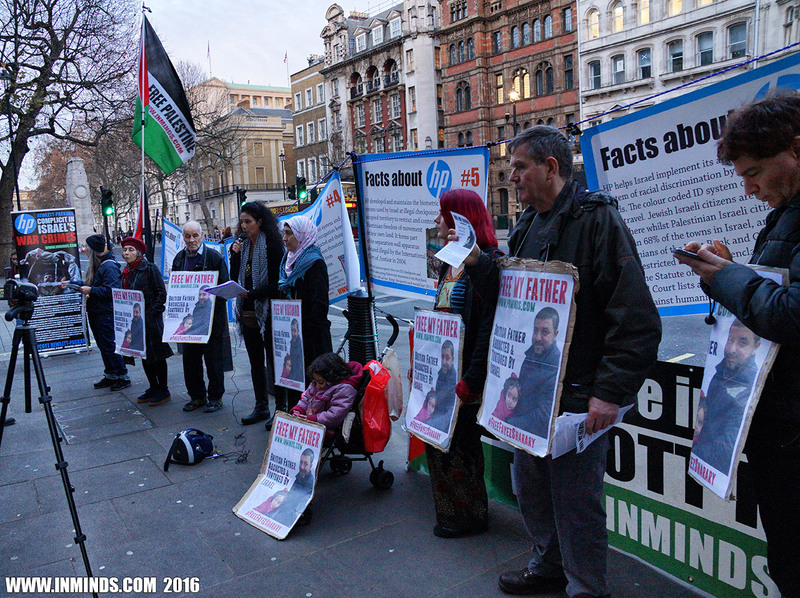 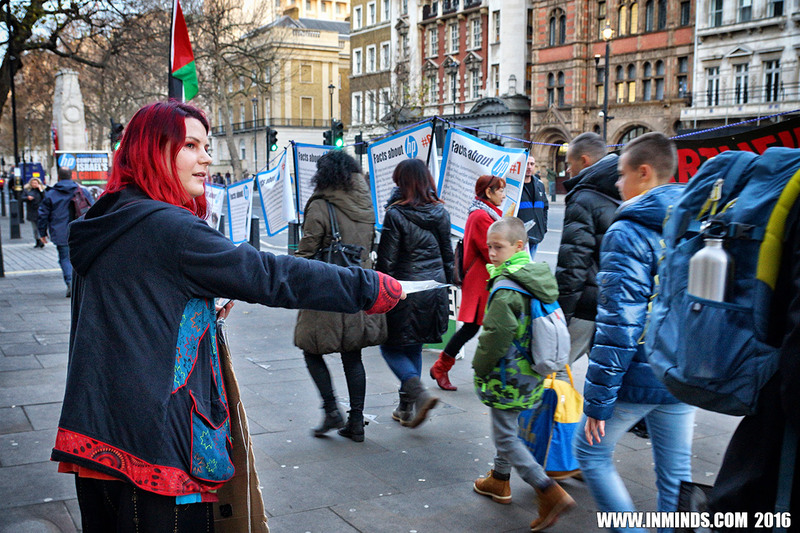 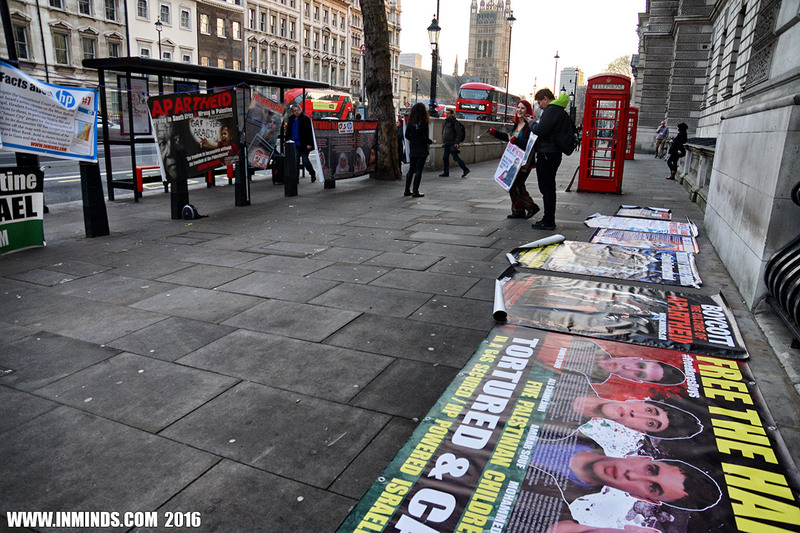 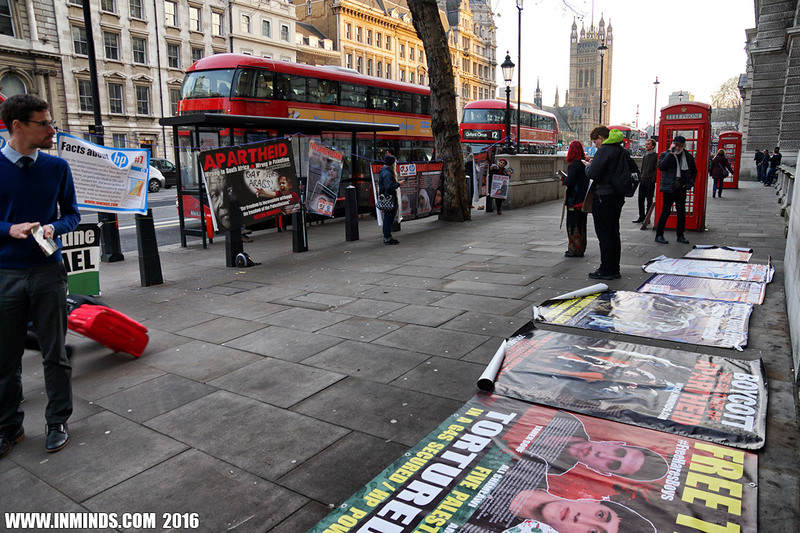 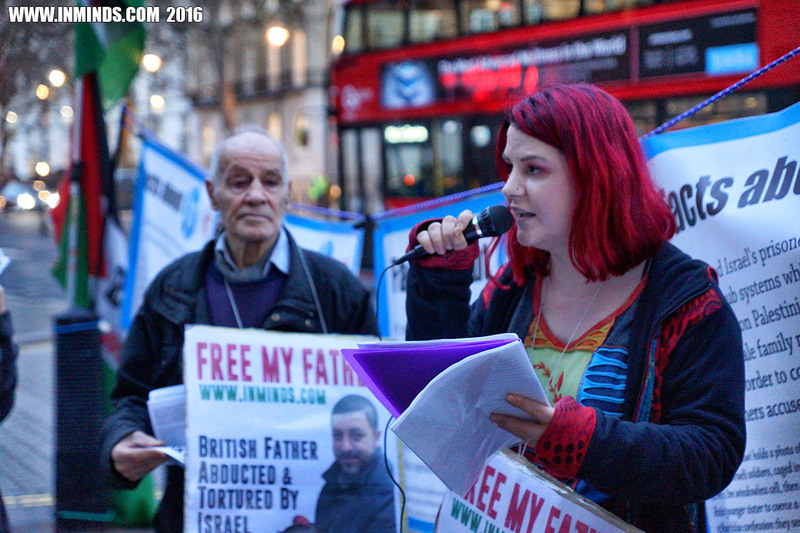 On 9th December 2016 Inminds human rights group held a vigil outside the British Foreign Office to demand that the British government act to free British citizen Fayez Sharary who has been imprisoned by Israel and who according to the Israeli judge's own admission has been tortured and should be released. 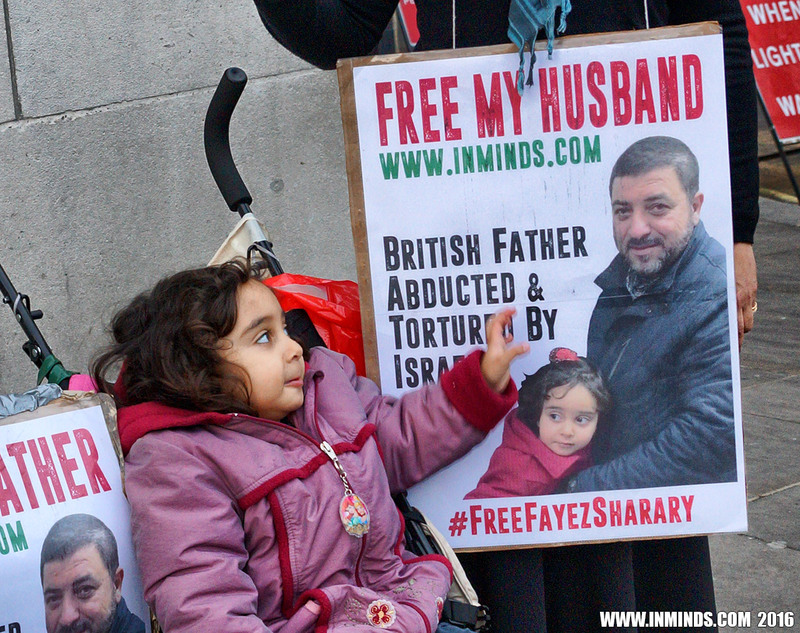 The judges ruling was quickly overturned by the military court and Fayez Sharary remains caged, now for nearly 3 months. 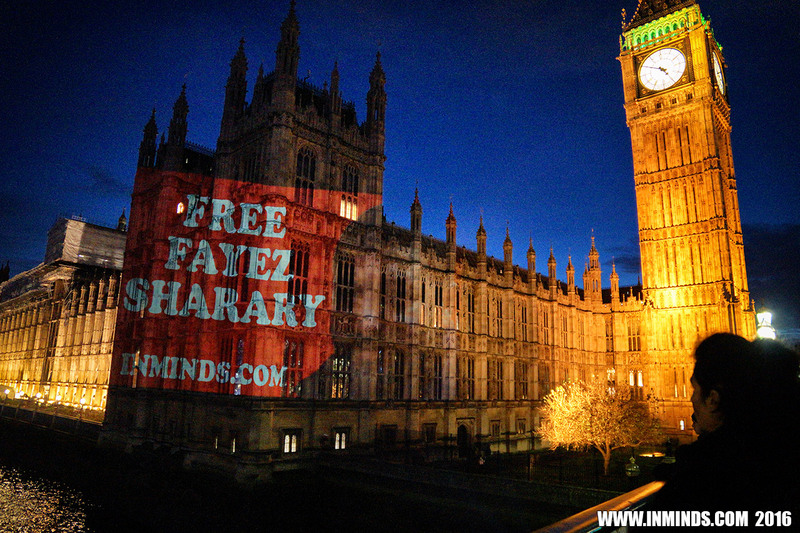 Fayez Sharary's military court hearing is next week on 14th December, its imperative that representatives from the British government attend the hearing. 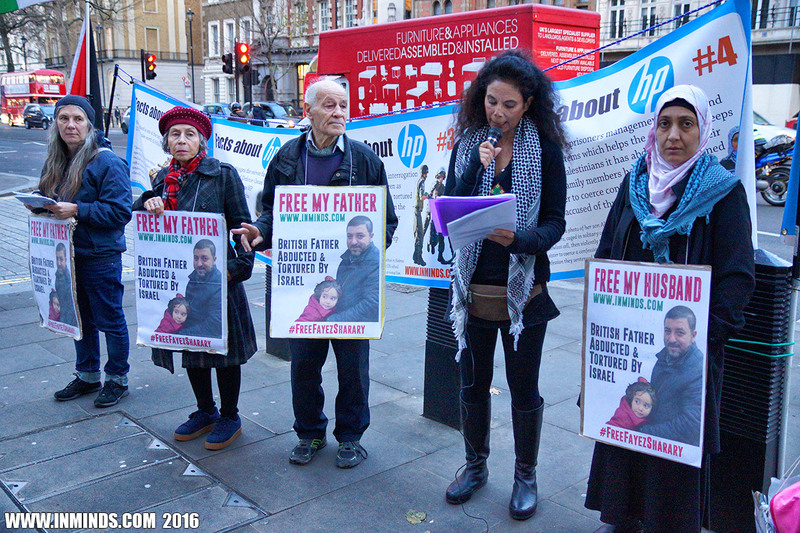 The United Nations Office for the Coordination of Humanitarian Affairs has described the farcical court proceedings "as if the courtroom were a fully-automated conveyor belt" observing that "every file [case] got a minute to a minute and a half of discussion". 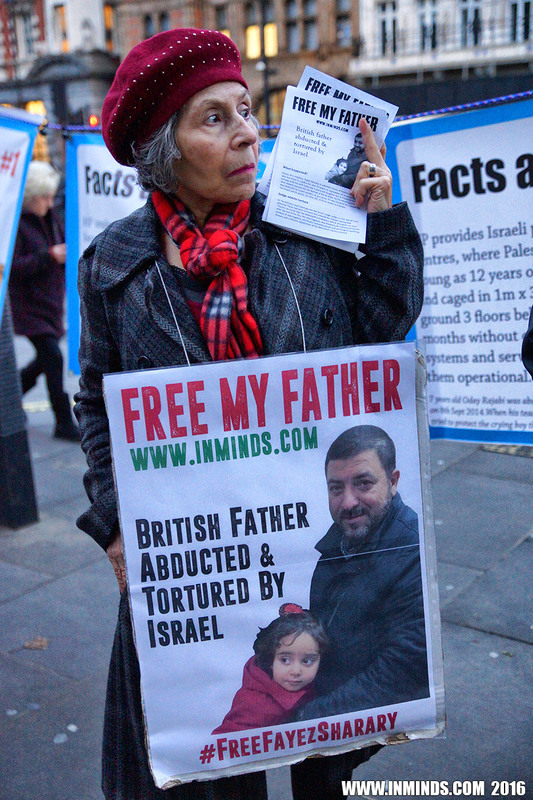 In 2010 the United Nations Special Rapporteur on the Independence of Judges and Lawyers found that the "legal foundations and practices of the military justice system [in Israel] do not comply with international standards". 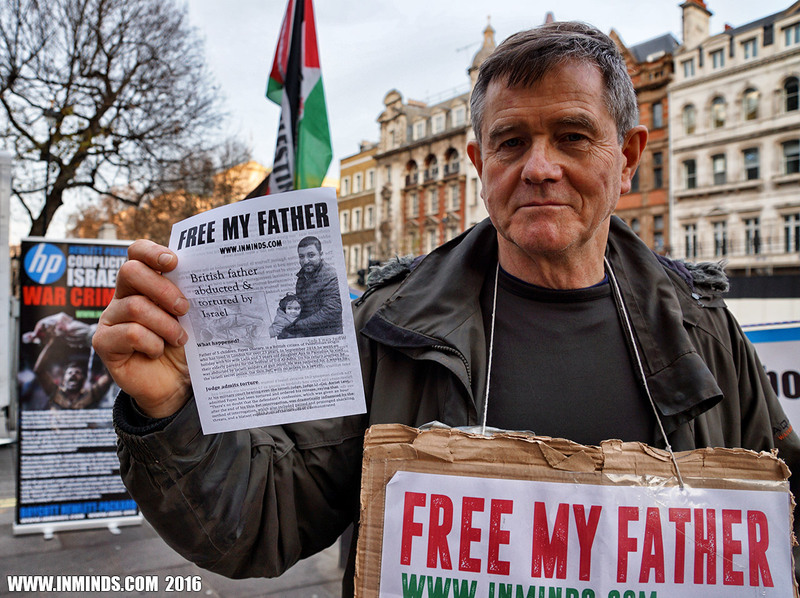 It is not surprising then that Israel military courts have a 99.74% conviction rate for Palestinians. 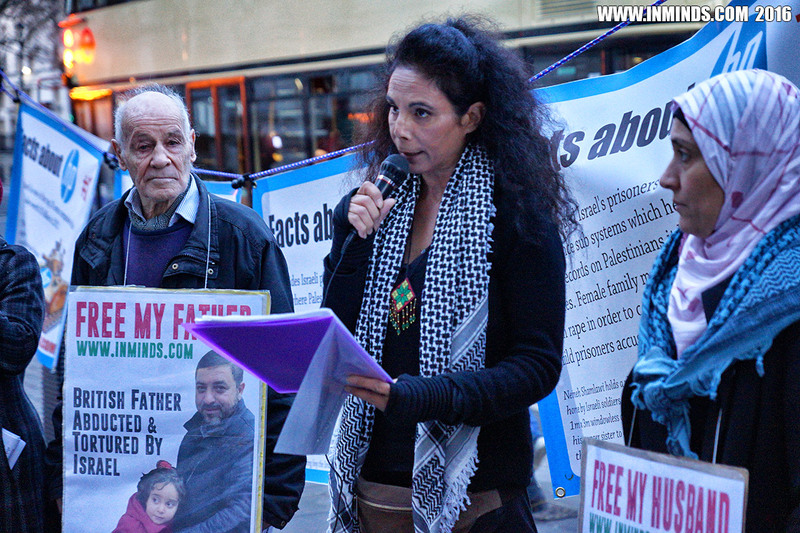 Fayez Sharary's wife Laila Sharary addressed the protest, she pleaded with the government: "While my husband languishes in Ofer prison, the only response I get from the British Consulate in Palestine is that they have no news for me. 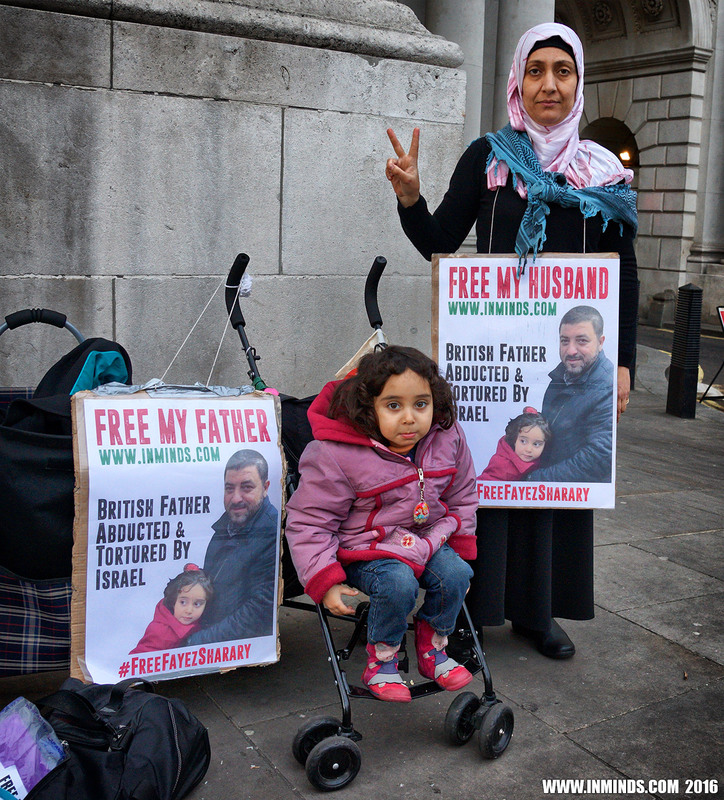 I urge you treat my husband like you would any other British Citizen and send someone senior from your department to oversee the court case on December 14th, and make absolutely sure that everything that can be done, is being done to facilitate my husband's release." 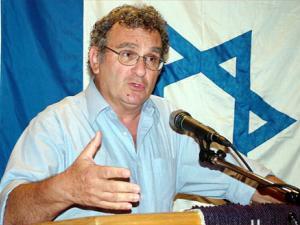 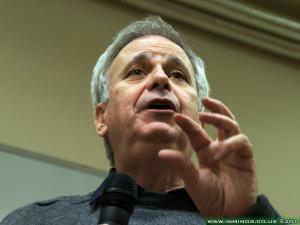 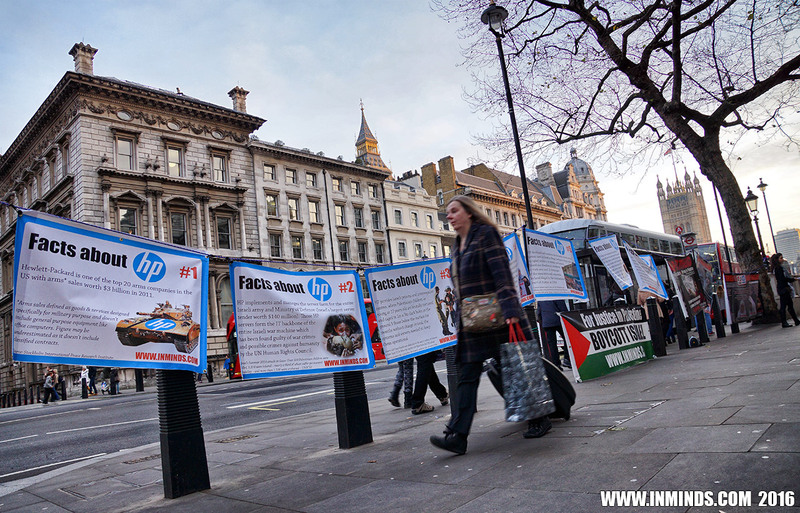 The protest also highlighted the role HP plays in Israel's torture and caging of Palestinians. 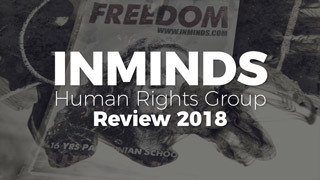 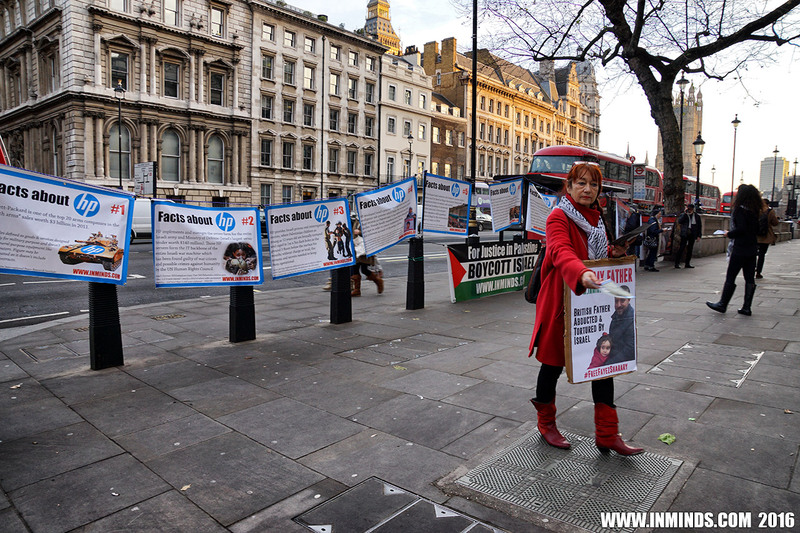 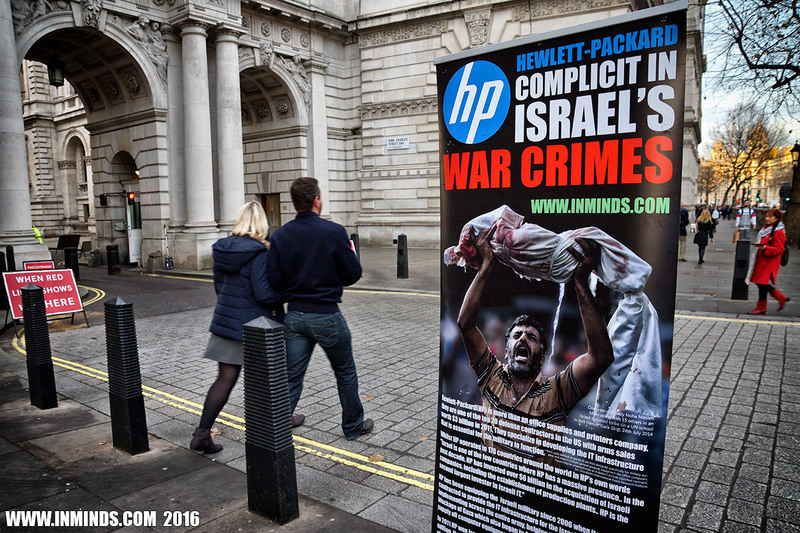 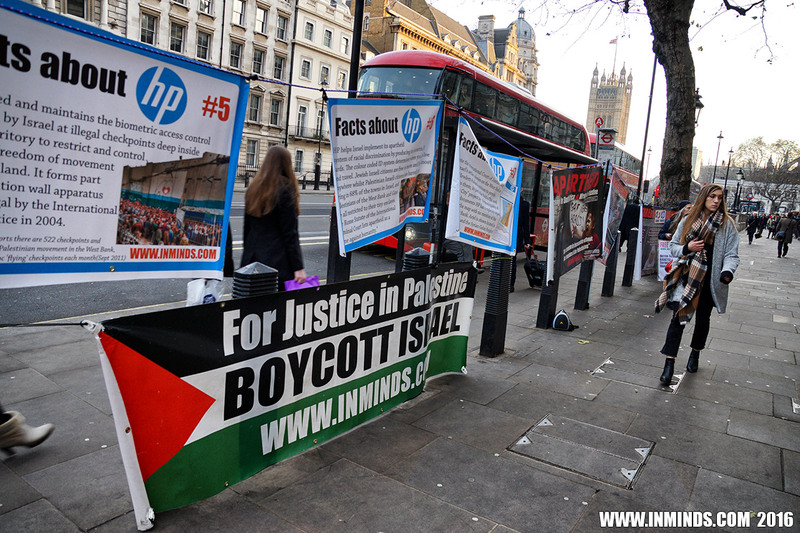 Inminds chair Abbas Ali said "Its unacceptable that just one street away, here in London, HP is selling its printers and laptops; and in Palestine the same company, HP, is assisting in the torture of a Londoner. 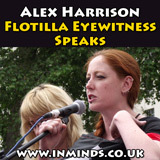 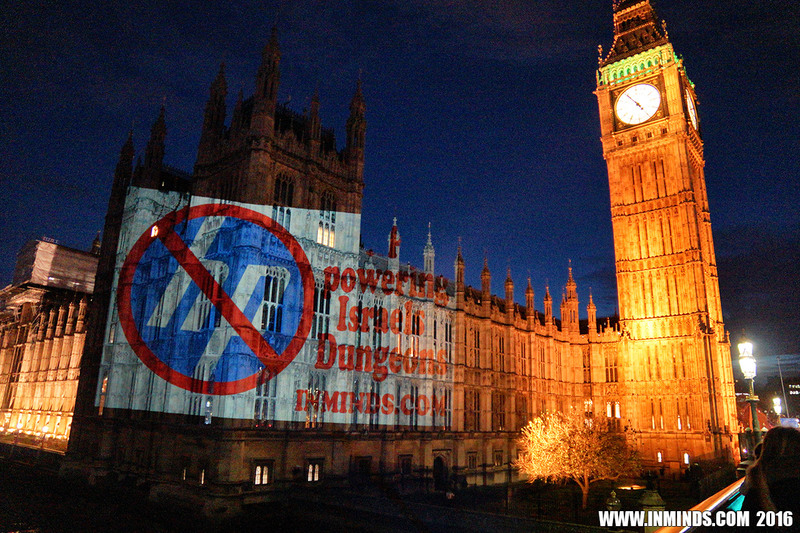 When Londoners are made aware of HPs dirty secrets they will rightly reject this company." 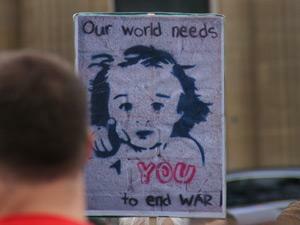 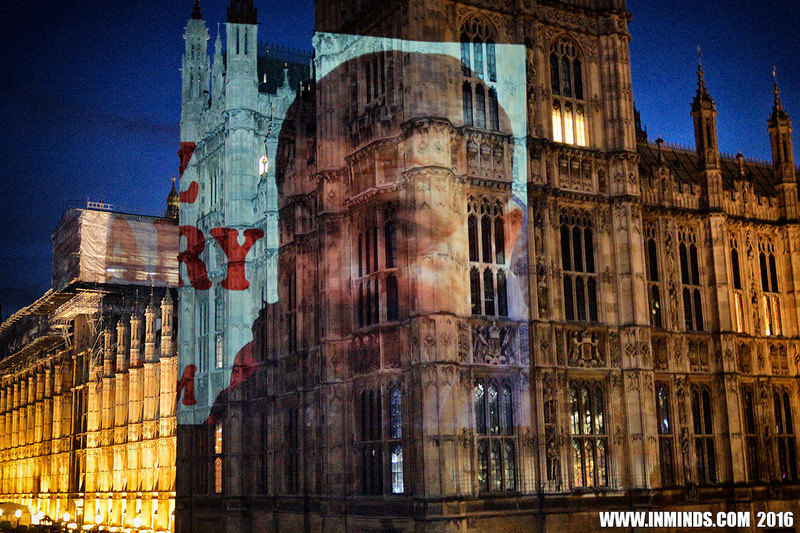 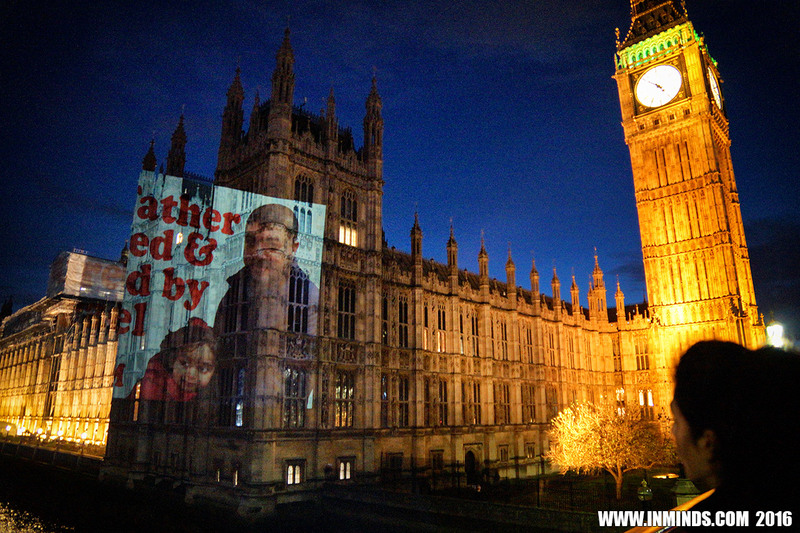 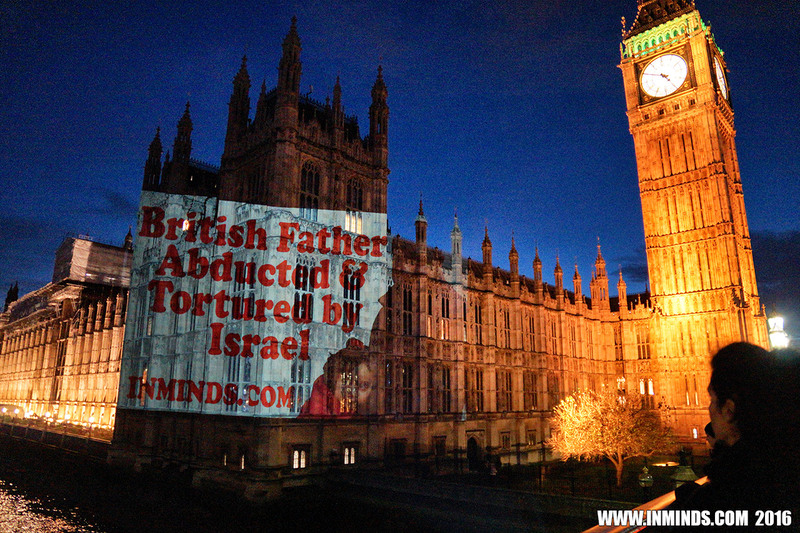 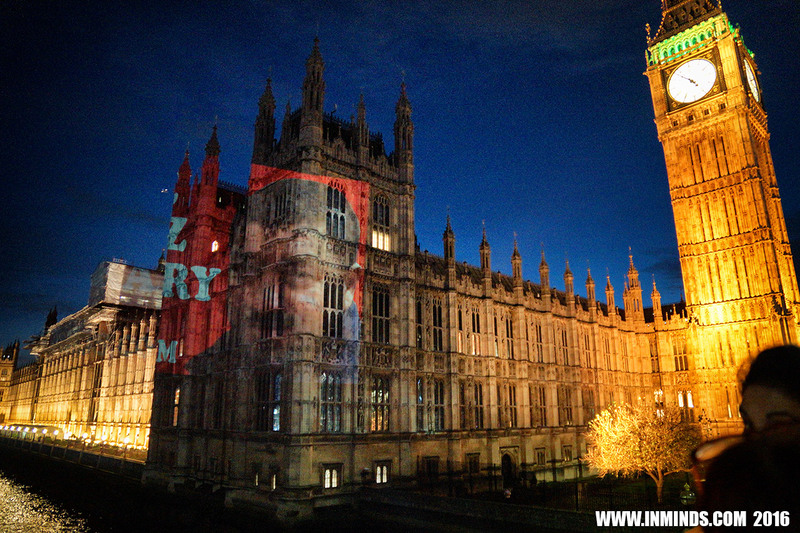 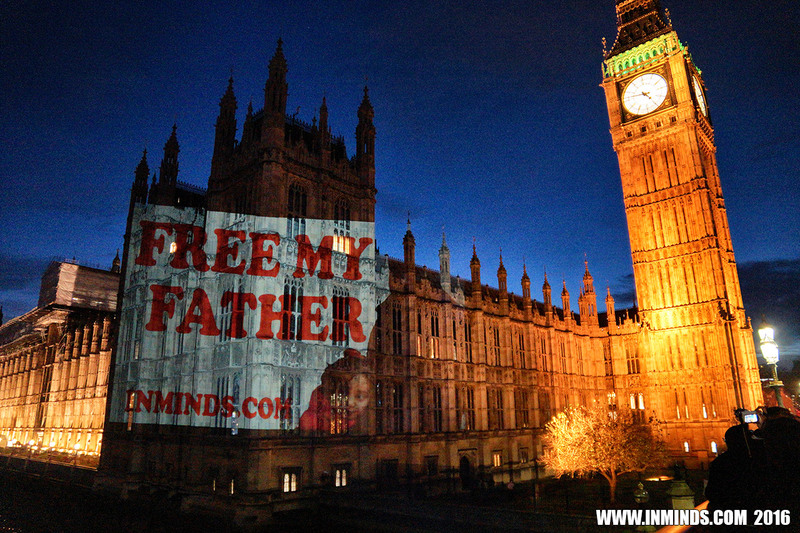 The protest ended with a projection on the walls of the Palace of Westminster, the seat of the British government. 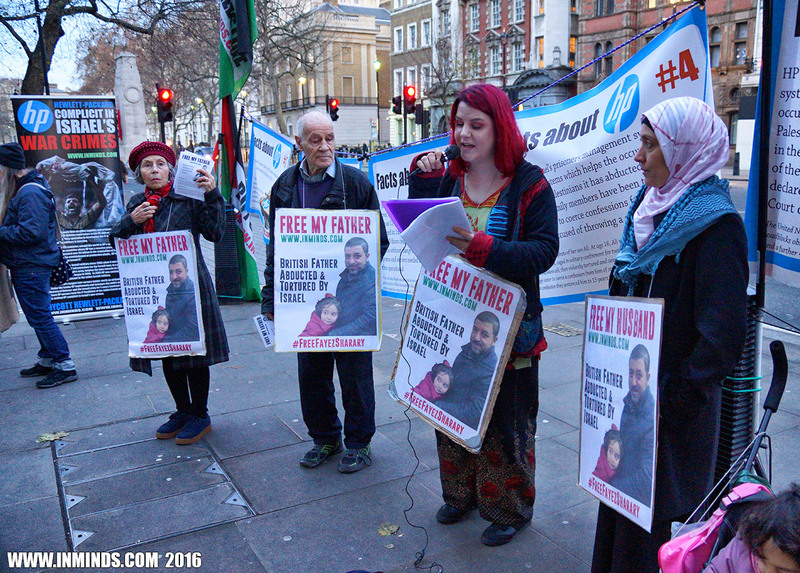 Following the protest outside the foreign office, the British government, for the first time, sent a representative from the embassy to Fayez Sharary's military court hearing on 14th December 2016, and it made a huge difference. 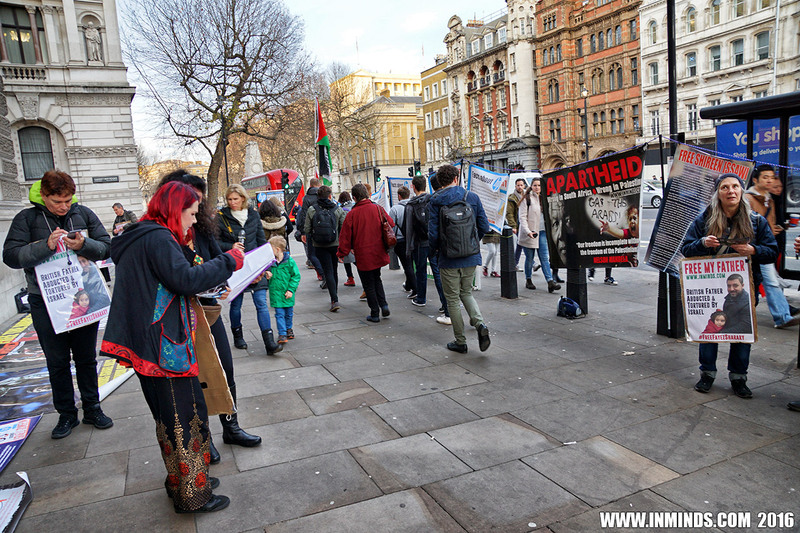 We learnt that the whole proceeding was conducted differently when compared to the previous hearings where there was no observer from the British embassy. 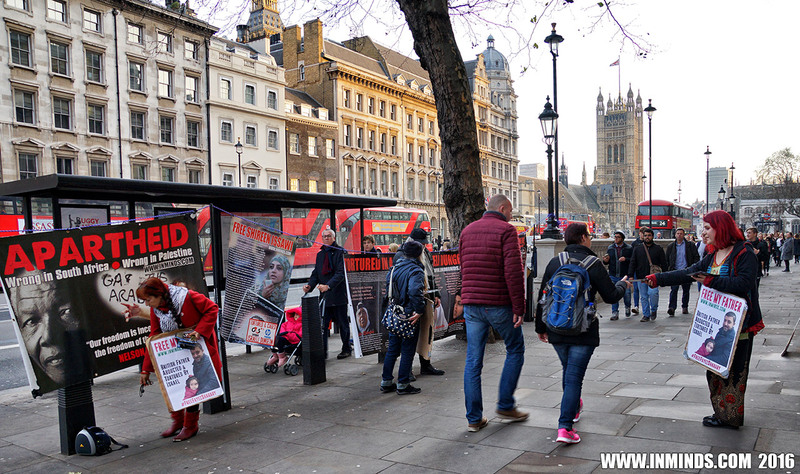 The judge's behaviour and the conduct of the prosecution was markedly different, acknowledging the existence of a defence lawyer and a modicum of respect for the process. 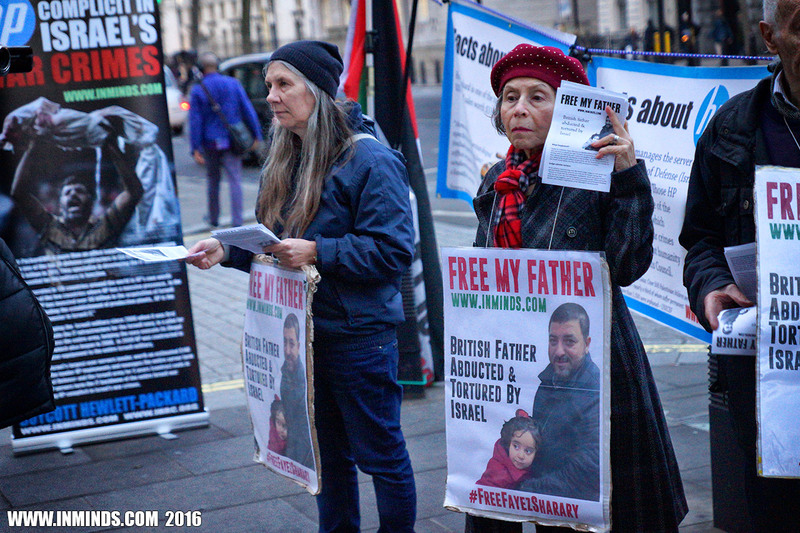 Unfortunately the judge is now insisting that the next hearing, on 8th January 2017 where testimony from the Israeli secret police Shabak will be heard, will be a closed session where representatives from the British embassy will not be permitted to attend. 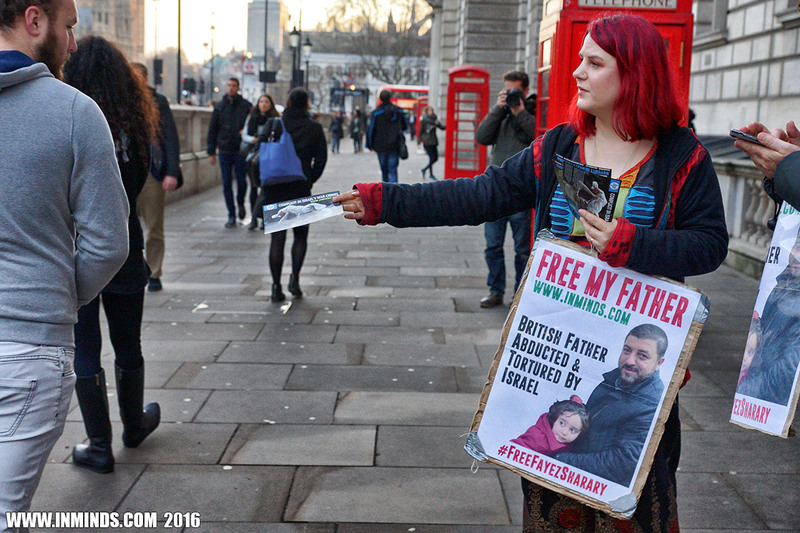 We are here today outside the British Foreign and Commonwealth Office to demand that the British government act to free British citizen Fayez Sharary who has been languishing in an Israeli dungeon for nearly 3 months now. 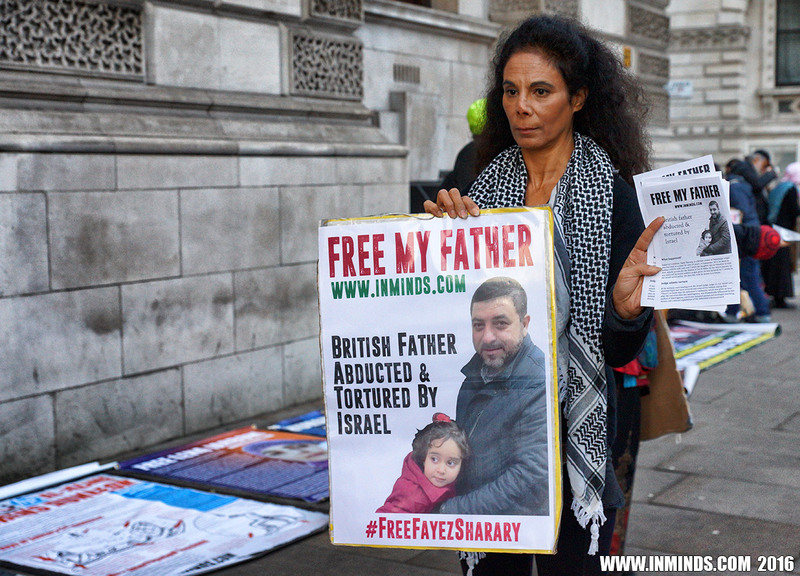 The presiding Israeli judge admitted that Fayez Sharary has been tortured by the Israeli military in order to obtain a false confession; he has categorically said the forced confession is of zero value and that Fayez Sharary should be released. 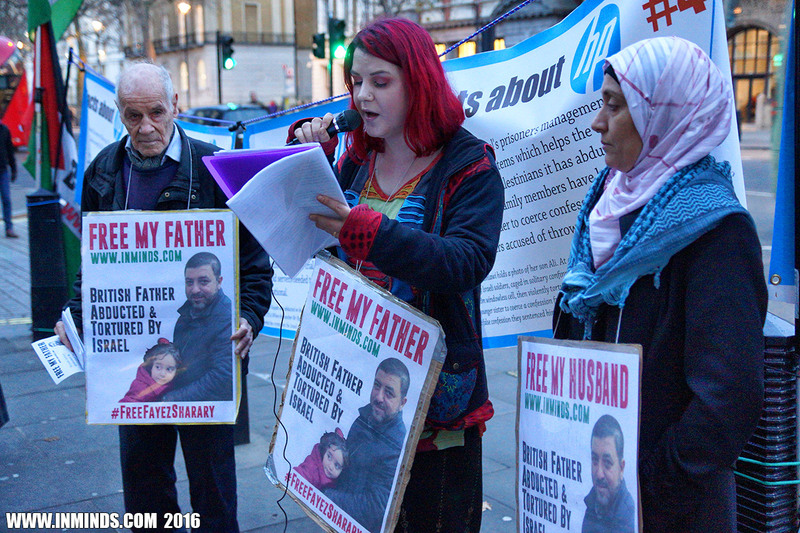 This was in October, but today Fayez is still imprisoned and the British government has shamefully done nothing to secure his release. 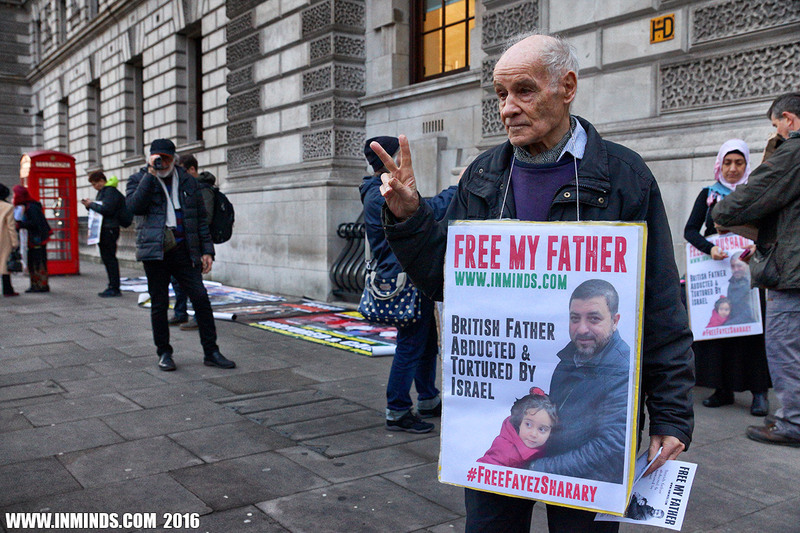 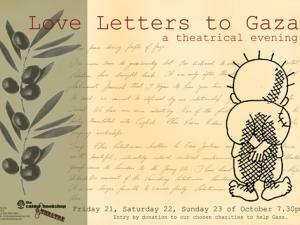 Fayez Sharary is of Palestinian origin, he was born in a refugee camp in Lebanon. 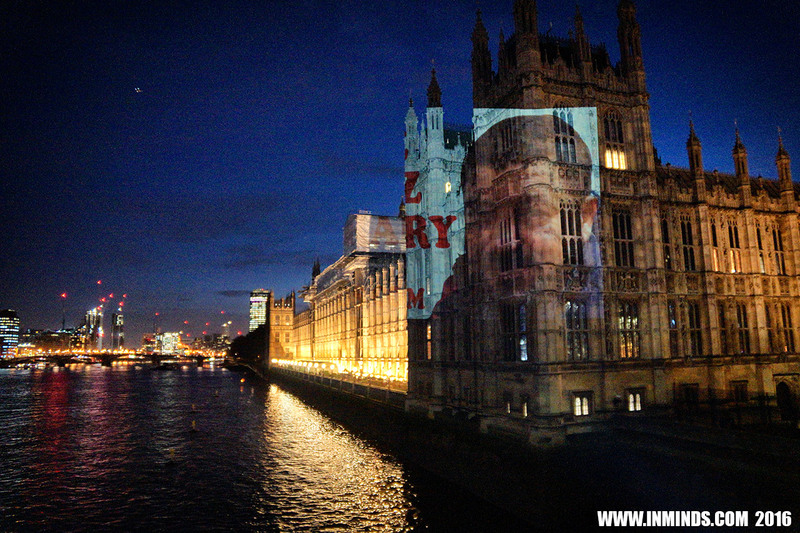 He is a British citizen who has lived in this city of London for over 23 years. 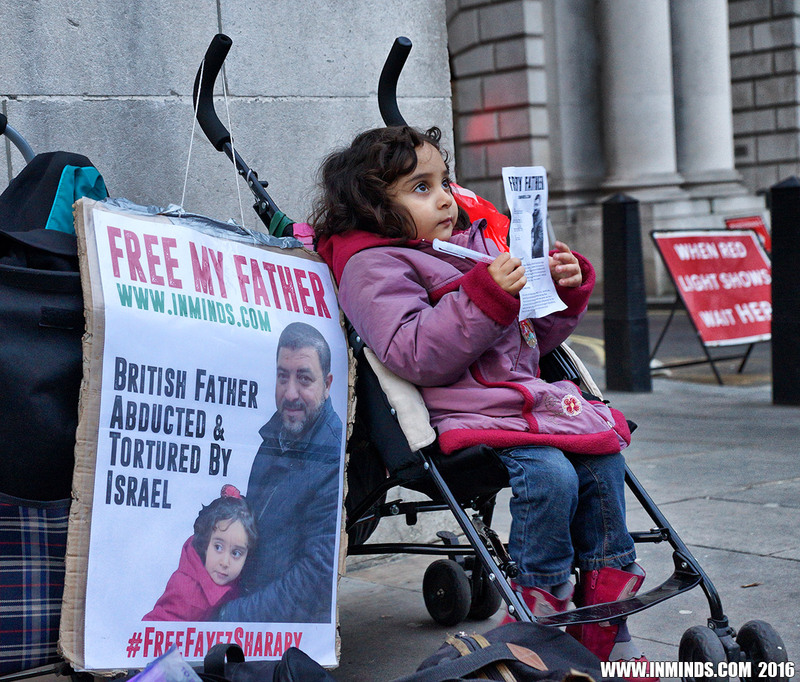 Fayez is a father of five children, his wife Laila and their daughter Aya are here with us today. 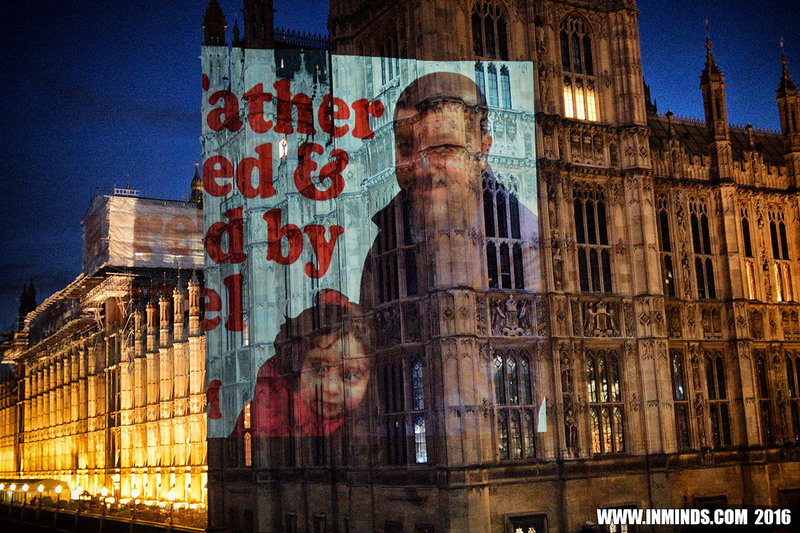 In September he travelled to the West Bank with his wife Laila and their 3 years old daughter Aya to spend the festival of Eid Al-Adha with their elderly parents in Palestine and to fulfil their dream of praying in the sacred Al-Aqsa Mosque in Jerusalem. 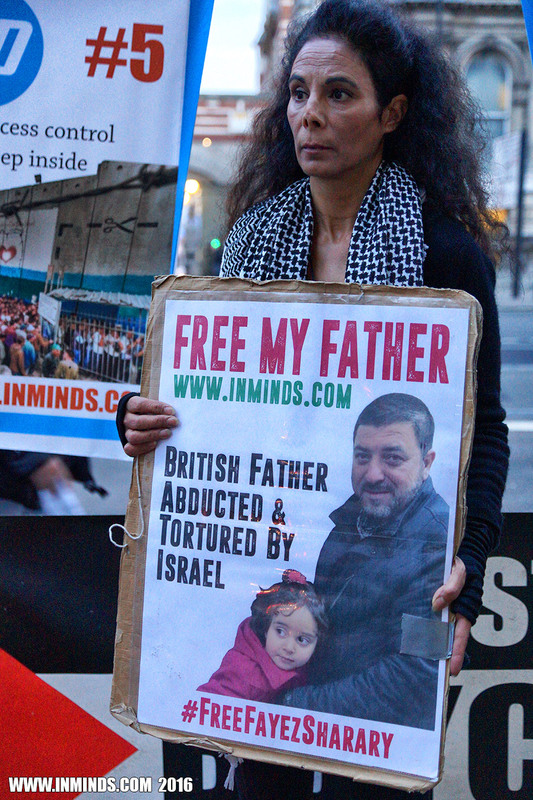 Among our confiscated personal luggage, was Aya’s security blanket; a small square soft towelling pink blanket, with a rabbit image printed on it; Aya has been missing that blanket terribly, but she takes comfort, even at her young age, that the blanket has stayed behind with her father, giving him comfort and keeping her close to his heart. 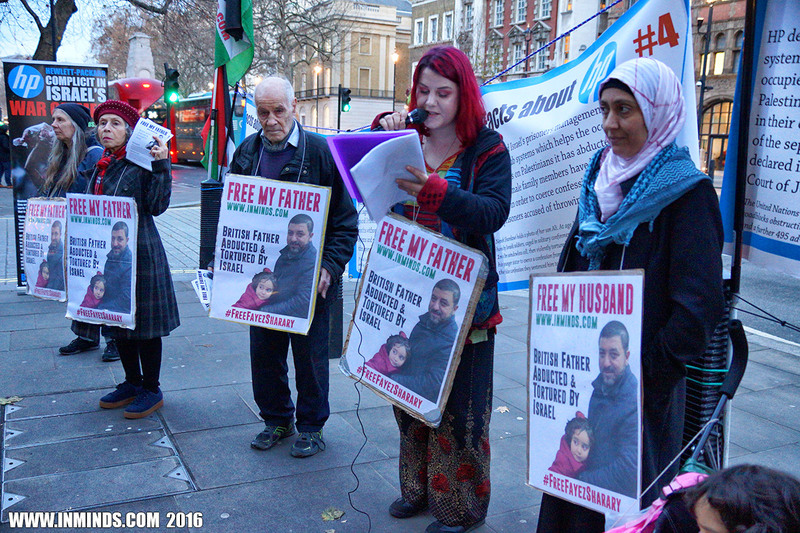 I urge you treat my husband like you would any other British Citizen and send someone senior from your department to oversee the court case on December 14th, and make absolutely sure that everything that can be done, is being done to facilitate my husband’s release. 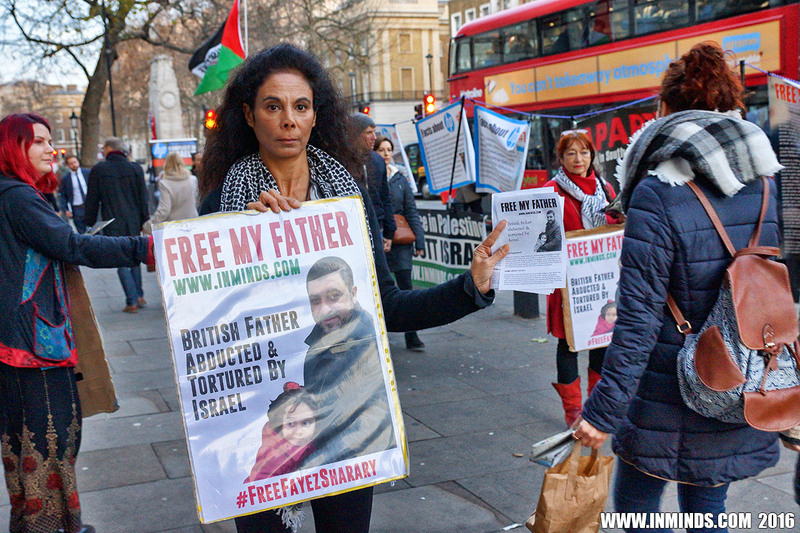 Thank you Laila, I just want to finish by saying that Fayez Sharary and his family are all British citizens, an Israeli judge has gone on record to admit that a British citizen has been tortured and that there is no case to answer, yet the British embassy has done nothing to secure Fayez's release! 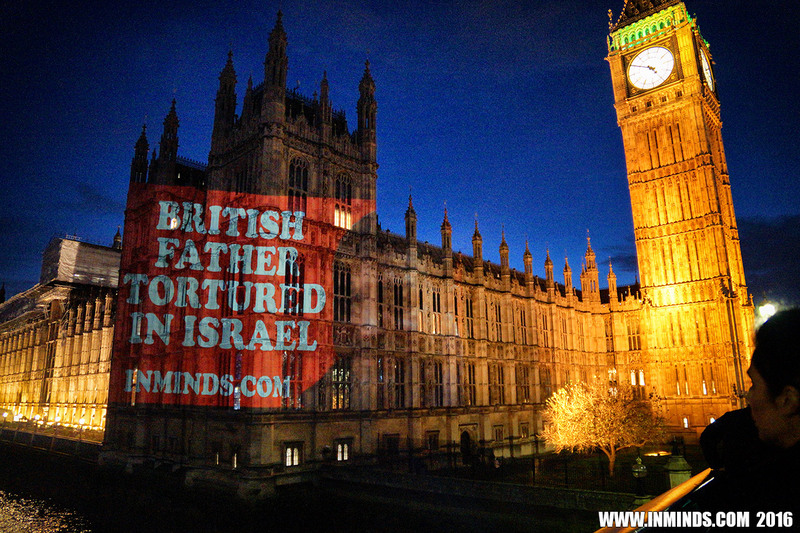 Admission by an Israeli judge that a British national has been tortured in Israel and is being caged for no legal reason should have raised alarm bells in the foreign office. 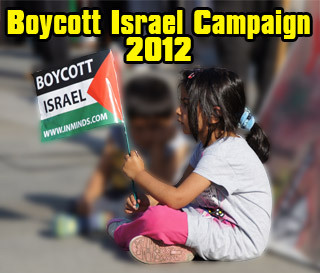 Yet no action has followed. 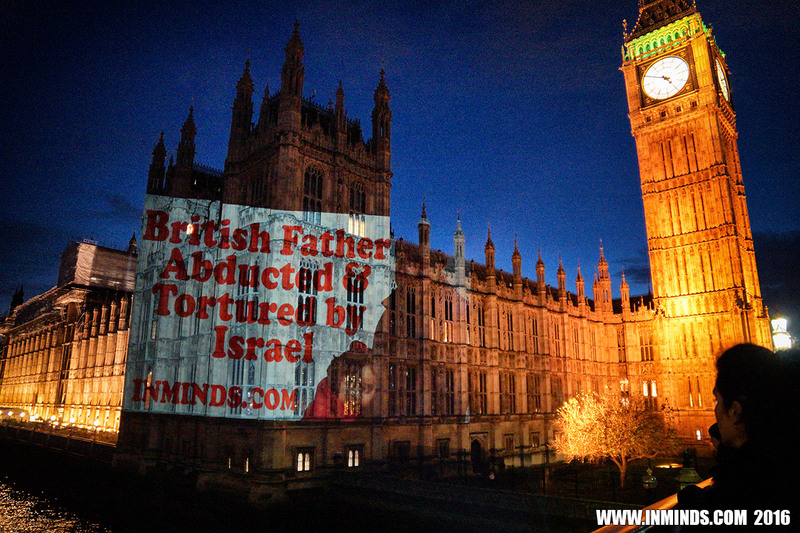 We are here to ask the British government not to abandon one of their citizens to an Israeli torture den. 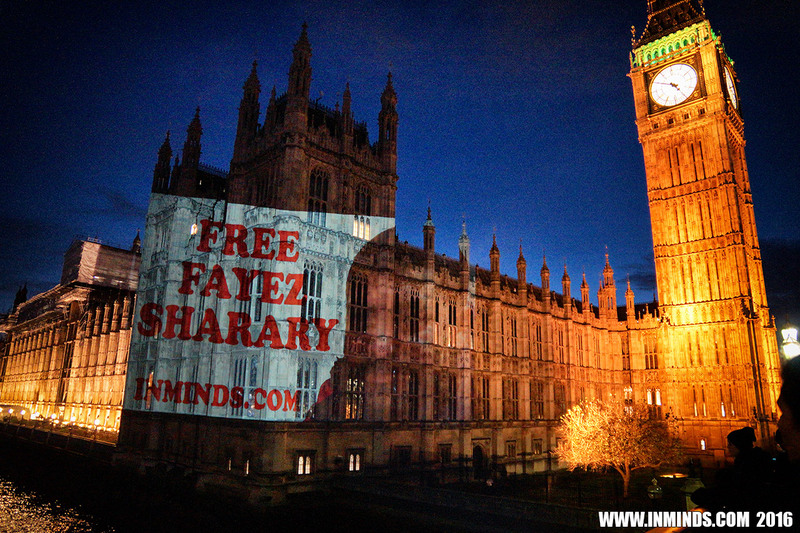 Fayez Sharary's military court hearing is next week on 14th December, its imperative that representatives from the British government attend the hearing. 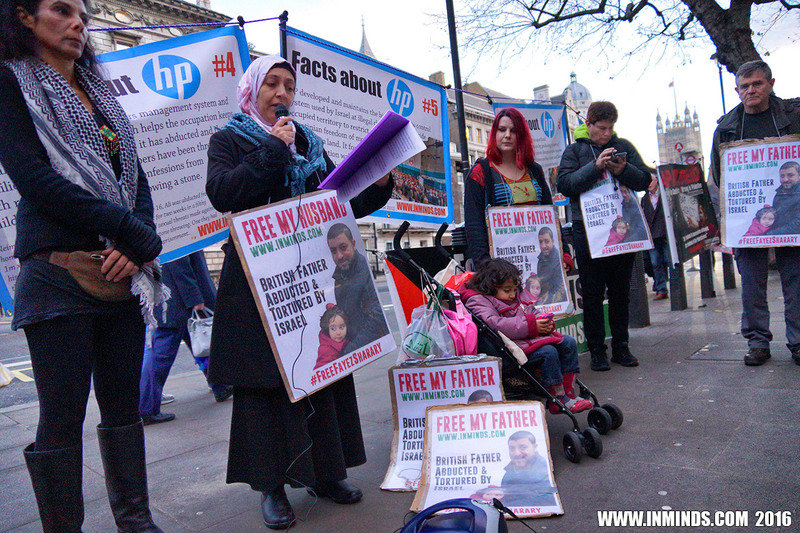 The United Nations Office for the Coordination of Humanitarian Affairs has condemned the farcical court proceedings saying its "as if the courtroom were a fully-automated conveyor belt" observing that "every file [case] got a minute to a minute and a half of discussion". 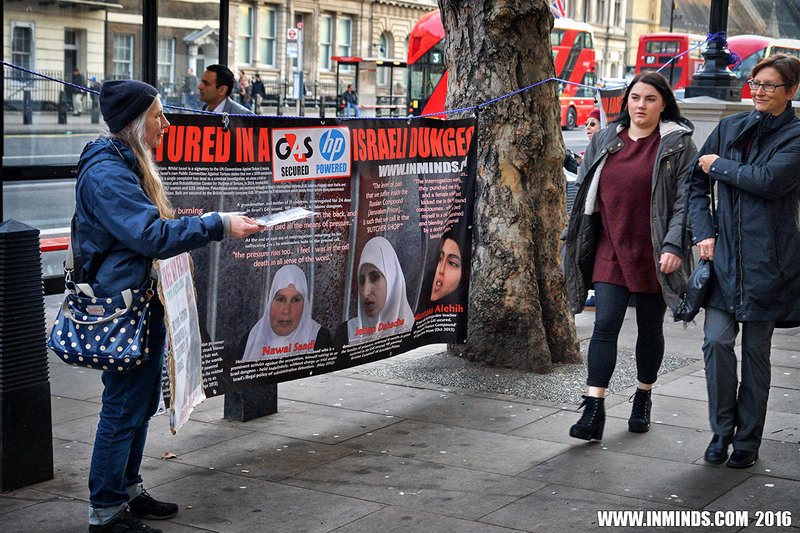 Israeli human rights groups have indicated that the presence of international legal observers at military hearings does make a difference to how the court is conducted. 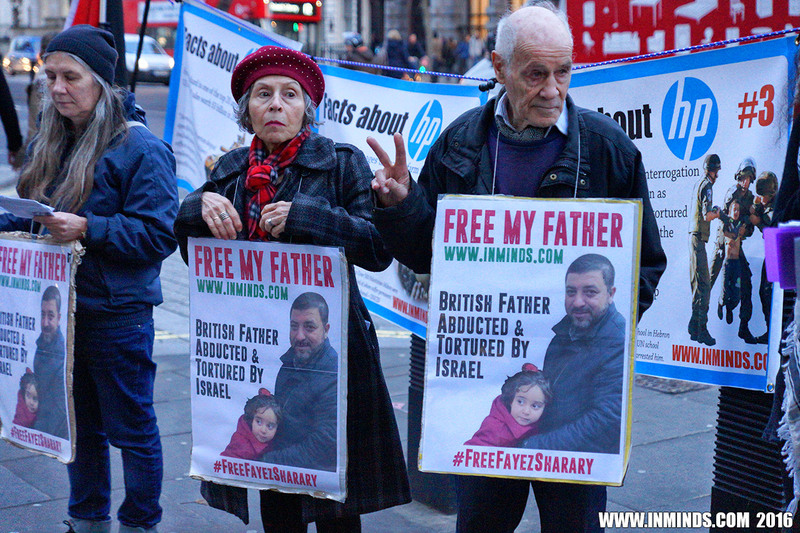 We ask the British government to send senior representatives from the British Embassy to attend Fayez Sharary's hearing and to lobby the Israeli government to release him. 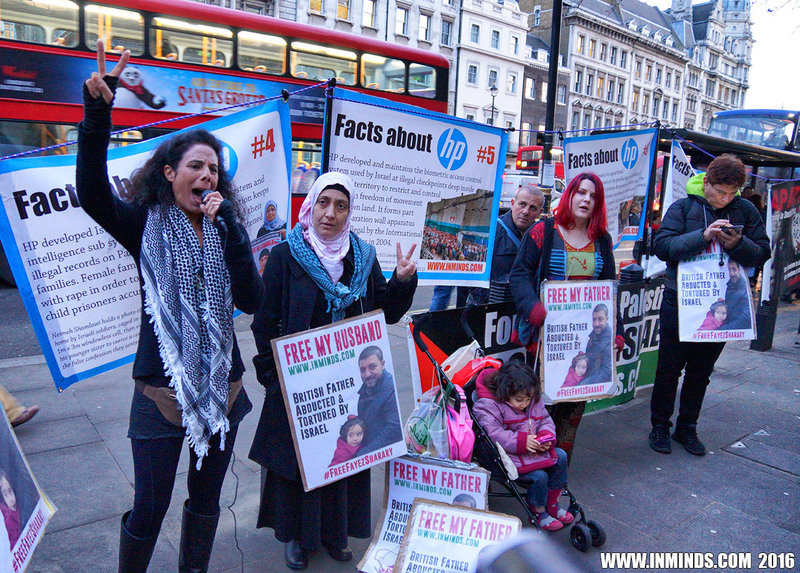 We are also here today to condemn the role of the technology company Hewlett Packard in the torture and caging of this British citizen by Israel and in its wider complicity in Israel's war crimes against the Palestinian people, in particular the 7000 Palestinian political prisoners caged by Israel. 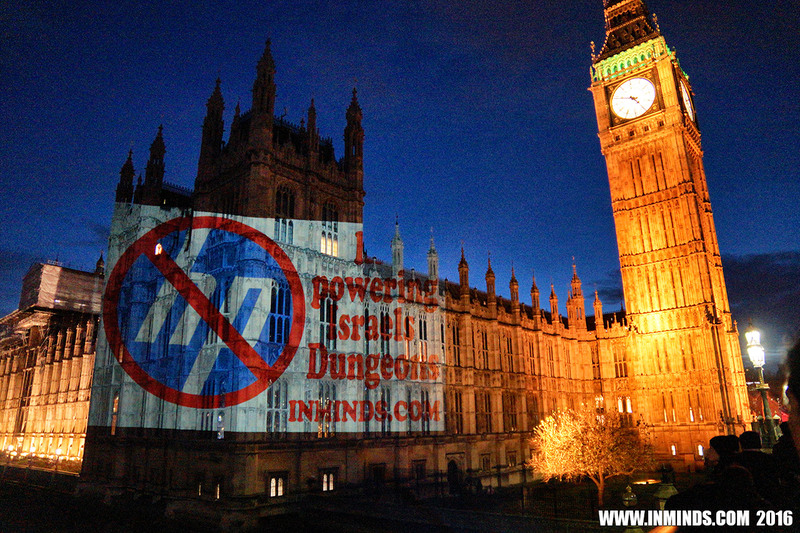 HP is fully complicit in these crimes. 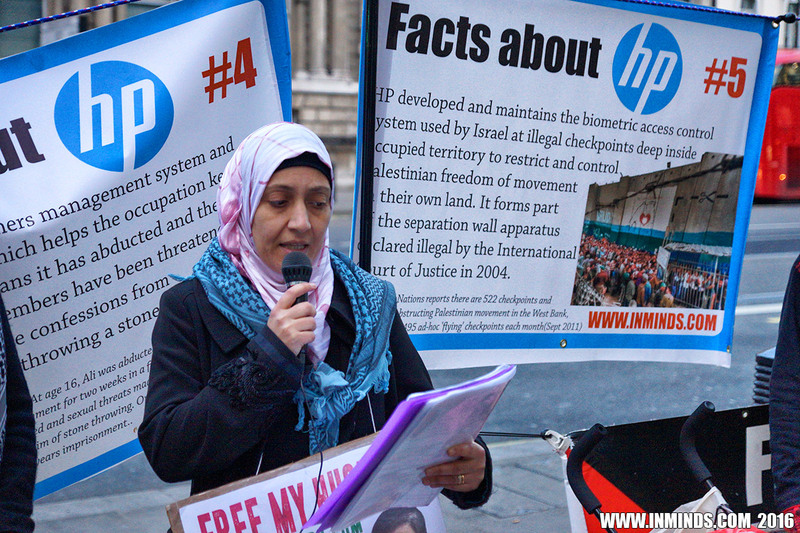 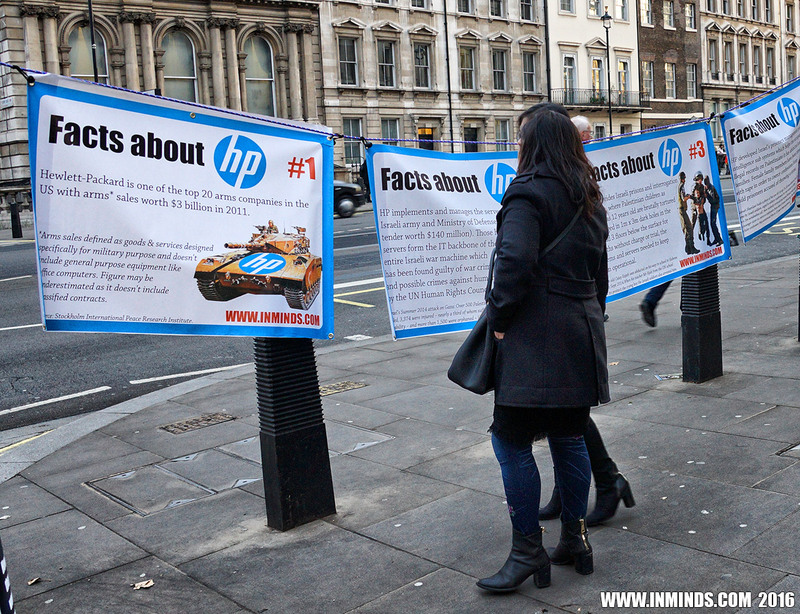 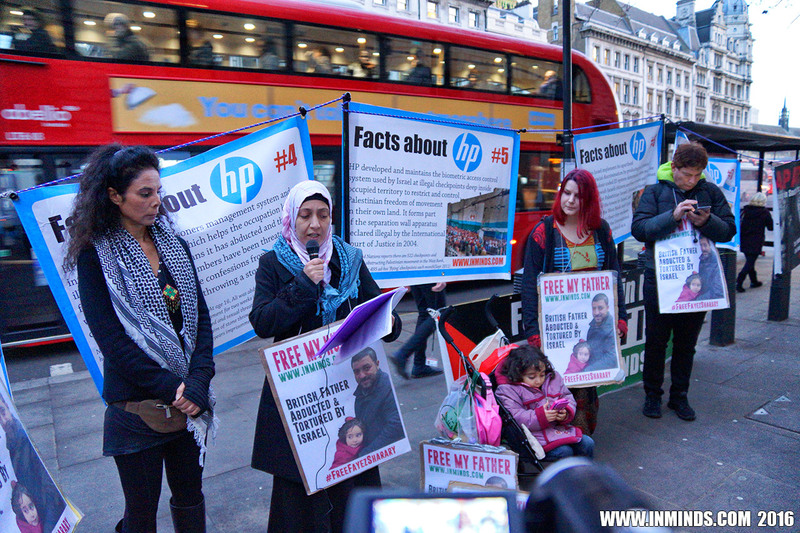 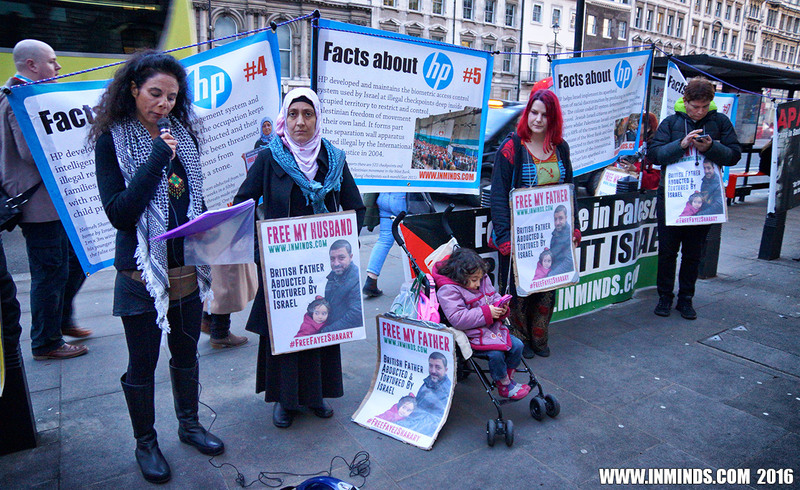 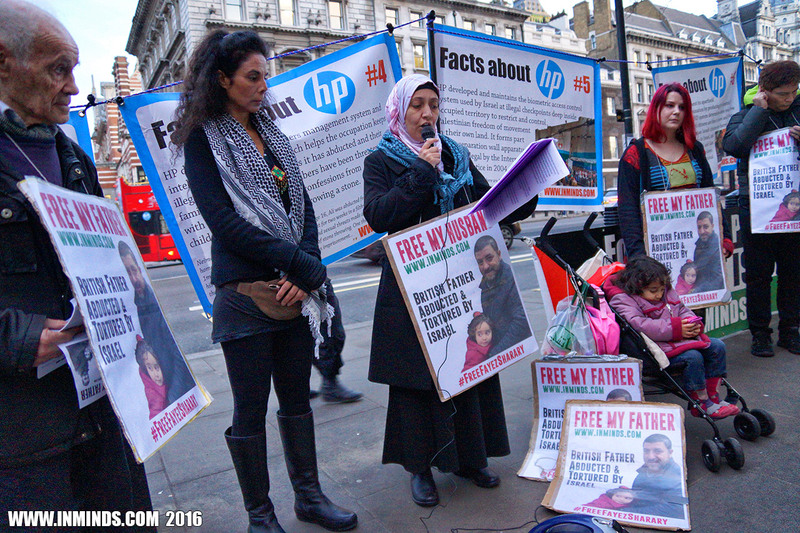 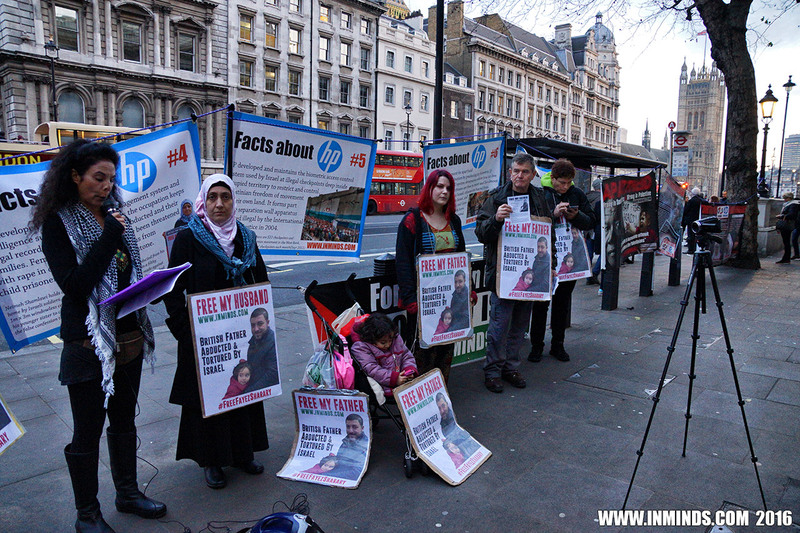 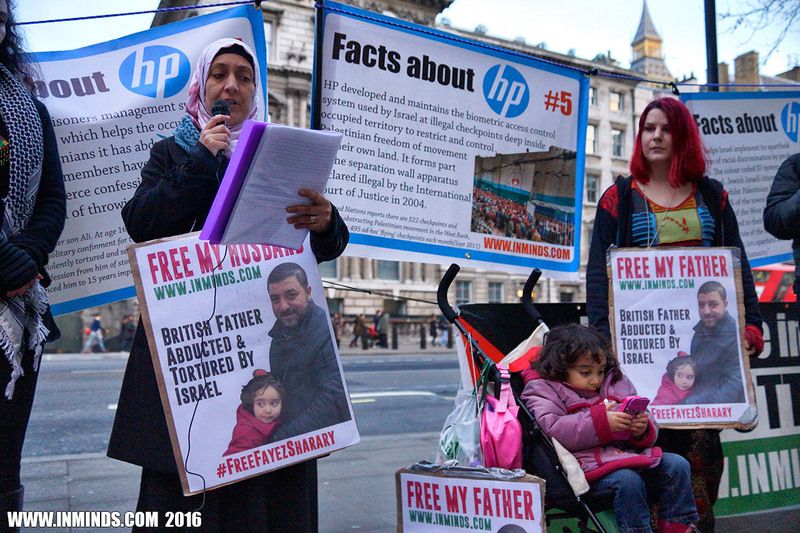 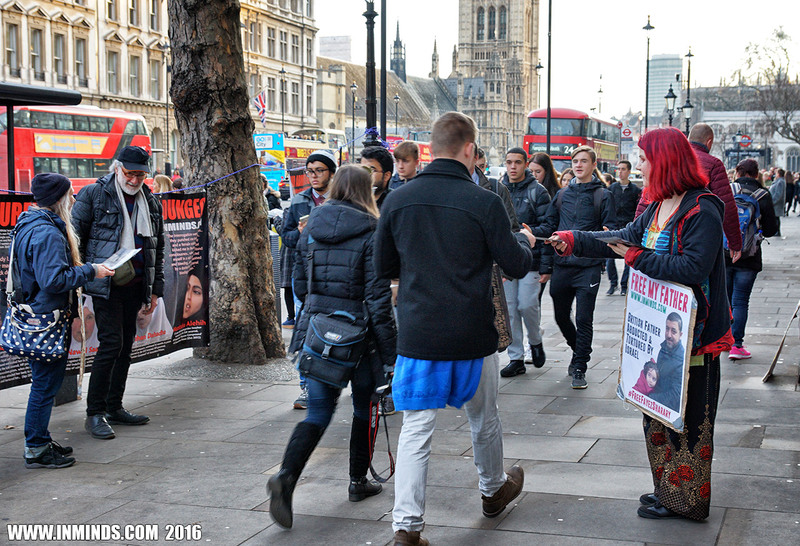 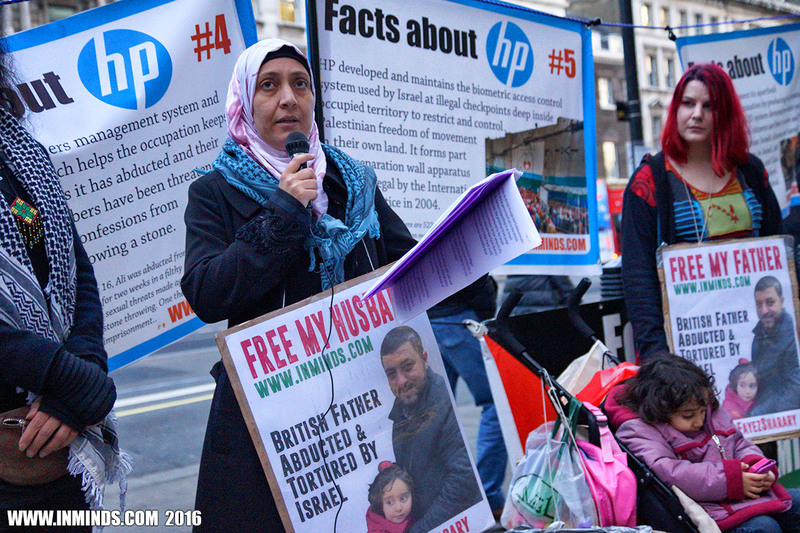 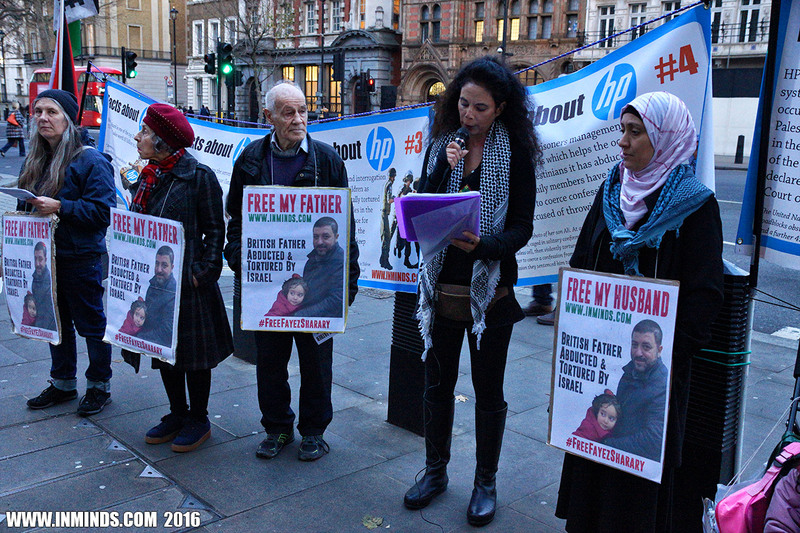 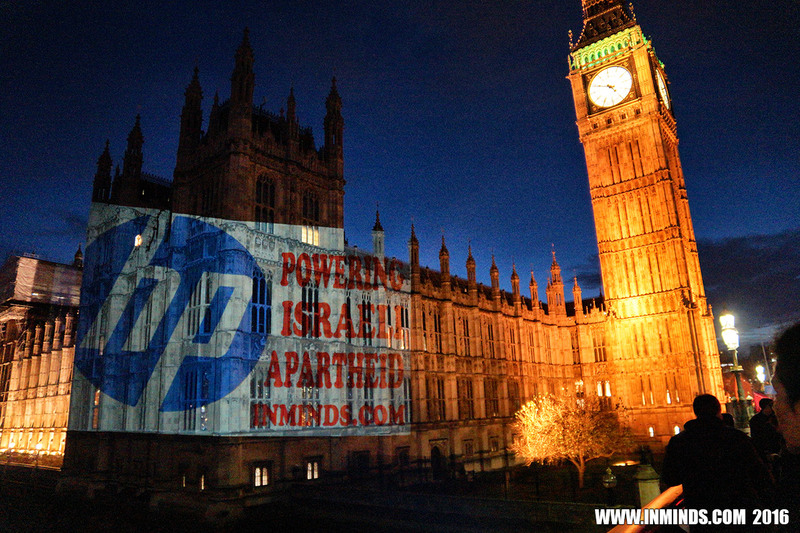 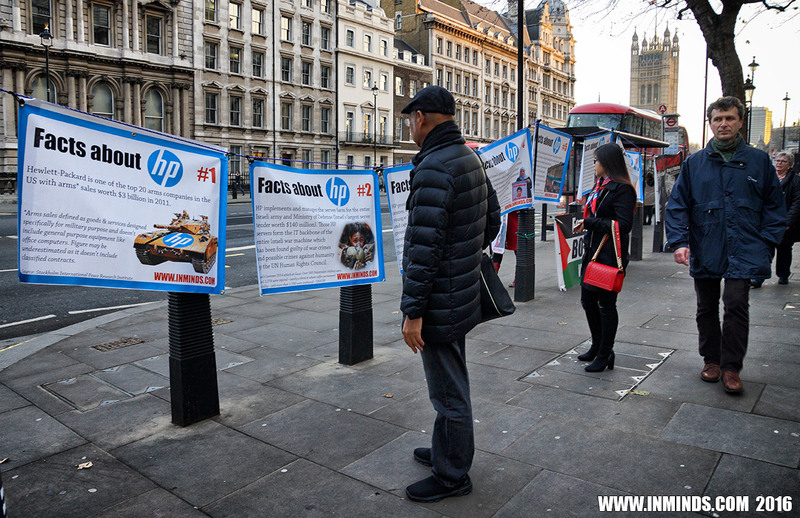 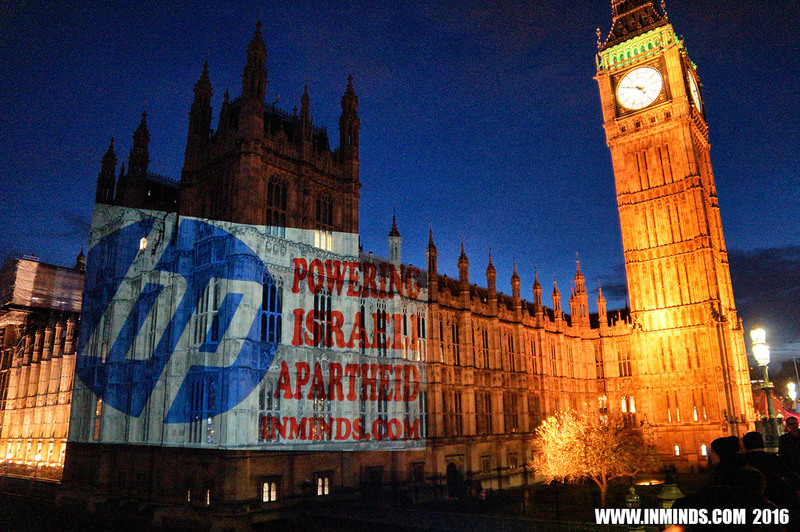 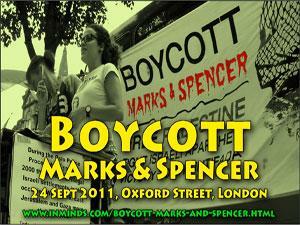 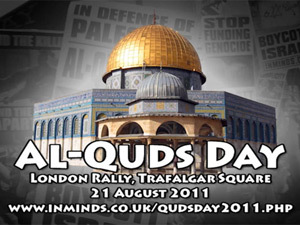 We ask the British public to show your support for justice and boycott HP products.